Our sponsors have shown their commitment to supporting the tech community in Fresno, and we cannot thank them enough for their generosity. The organizations below have provided equipment, financial assistance, and/or other benefits to the hackerspace. We want to see your logo on this page! Our sponsors are a big part of keeping this ship sailing. 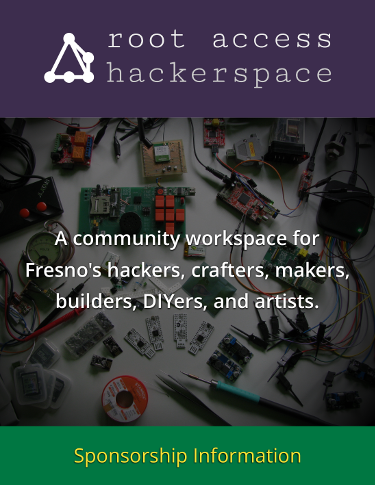 Take a look and see how you can make meaningful contributions to the hackerspace. Psst... Did we mention there are perks? Hit us up at info@rootaccess.space if you'd like to chat about sponsorship opportunities. We're totally flexible on perks, too, so please let us know if you have additional ideas, and we'll try to make it happen!